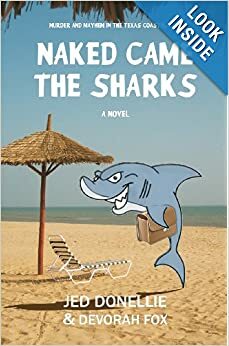 In Naked Came the Sharks, Holly Rivera Berry is chasing her dream of becoming an investigative reporter in San Francisco when she has to return to her hometown of Bonafides on the Texas Coastal Bend to settle her recently deceased father’s estate. She discovers that just before he died her father researched the possibility that via an old Mexican land grant the Rivera family owns The Gap, a natural channel to the Gulf of Mexico. Land speculators plan to erect luxury homes, resorts, hotels, and a casino along The Gap and Holly comes to doubt that her father died of natural causes. We found Holly taking a break at a Bonafides beachfront bar, the Tropics. We bought her a margarita and some nachos and plied her with questions. Andrea: Tell us about the San Francisco paper that you work for, the Mission Crier. Holly: It’s a shopper, like the Pennysaver. Lots of classified ads plus some syndicated content like jokes, helpful household hints, Top Ten lists and trivia. It’s a two-person operation. My boss manages the distribution, sales, and negotiates the contracts, and I do the layout, paste-up and prepress. Alice: Did you resent Rusty quitting your job for you? Holly: I did. I’d about had it with arrogant men making decisions for me. I had to admit thought that although it was something I thought about doing but I wouldn’t have done it, or at least not so impetuously. Alice: Did you ever call your boss to tell him that though Rusty spoke for you, you want to confirm that you want to quit and start your own more significant newspaper? Holly: I did call to apologize and then I gave proper notice and arranged an exit that wouldn’t leave him in the lurch. That wouldn’t be professional. The newspaper biz is actually a fairly close-knit community. Burning bridges is not a good career move. I did tell him that I was thinking of starting my own publication. Since we parted on good terms, he said I could call on him if I needed advice. Alice: Will you start that paper in a future book or will you make use of your detective talents and start an agency? Holly: Start a paper, definitely. Being a journalist is like being a detective in some ways except I get to share what I’ve learned with a lot of people instead of just the person who hired me. Alan: There should be consequences to murderer for this brutal act. Do you intend to prosecute? And inasmuch as the cartel group collectively hurt you too, the same question applies to each member of the cartel. Holly: That’s a criminal act so pursuing all that would be up to the county court. If I’m called to testify of course I’ll tell what I know. Those crimes should be punished and those people shouldn’t get away with anything. Alan: The Cartel members may be released from incarceration someday. Some might now be incarcerated at all. Do you have any fear they may try to hurt you again? Holly: Now there’s a scary thought. I wouldn’t put it past them. I think the best thing that I can do is become a person to be reckoned with so they’re less likely to try. Alan: Are you planning any civil lawsuits against cartel members? You obviously suffered at their hands. Holly: So much has been going on, I really haven’t thought about that. I’m sure after a while I’ll get angry enough about what they did to want to take action but for now I want to look ahead, not back. Alan: What will you name your new Bonafides newspaper? Holly: Good question! You’d think since this is my dream I’d already have a name but I don’t. I have in mind to run a contest and invite people in the community to suggest a name. It would be a good way to get readers invested in the paper. Alan: Do you think you will be successful if you attempt to convince Rusty to get his law license reinstated and him return to practice? If so, will he be a part in the Rivera land grant case? Or, do you think Rusty is too close personally? Holly: I don’t like being told what to do and by the same token I wouldn’t presume to tell Rusty how to manage his career. He enjoys being a fishing guide and he might not be real eager to get back into a suit and tie. But I think he’d be great and I’d certainly support him if he wanted to return to the legal profession. He certainly has gotten me interested in finding out more about the land grant but I would need help. Alan: Do you trust your brother after all this? Holly: Oh, poor Tres. He does have some issues, doesn’t he? I’ll always love him, but trust him? I want to be supportive and give him the benefit of the doubt. Let’s say I’ll proceed with caution. Alan: Most importantly, what will become of Forceps? Will Forceps learn some new and exciting phrases? Holly: What a character he is. “Polly want a cracker” might be too much to hope for, but we can try.